Welcome to my Apeman A80 4K action camera review! 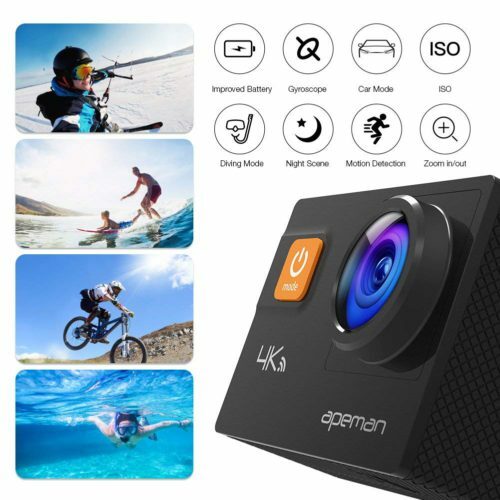 Today I will talk about the Apeman A80 action camera which was released back in 2018. Now to be truthful, I always think of GoPro when it comes to action cameras since they are the leader in the action camera market. But we all know that GoPro cameras don’t come at a cheap price. There are a lot of great alternatives that are much cheaper. Some are good quality and some other that aren’t and those can never compete with GoPro. 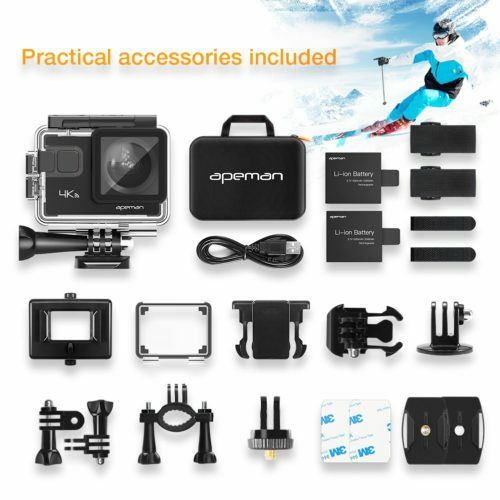 Do you think the Apeman A80 will be able to go against the GoPro? Le’s discover that through my below review, where I will try to give you as much detail as possible starting from what’s in the box then talking about the specs, settings, video, photo, audio and app. Let’s start with the specs then the un-boxing! Video Resolution: 4K 24fps/ 2k 30fps/ 1080P 60fps/ 1080P 30fps/ 720P 120fps/ 720P 60fps & more. The camera comes in a hard zip up case with a carry handle. Everything fits nicely and neatly in this case, it’s really good for travelling. batteries which gives around 120 minutes of video recording per battery. You get a few accessories, a user manual and a cleaning cloth. Note that there is no remote control included with the camera. 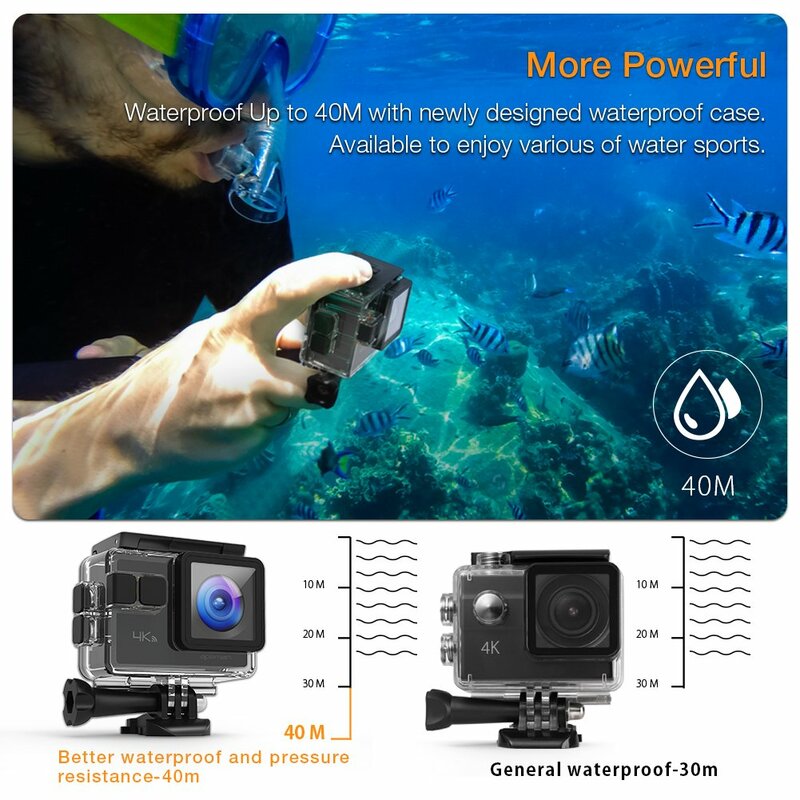 The A80 has a waterproof case that can be used down to 30 meters underwater. At the front, you got the 170 degree wide angle lens which is adjustable in the camera’s settings. You can adjust the field of view angle down to 70 degrees. Apeman claims that the A80 can shoot 4K videos at 24 frames per second and can take 20 megapixels photos. You also have the power button that is used to turn the camera On and Off, and also used as a Mode button to change between shooting modes (video, photo, playback and settings). The Apeman A80 comes with the Sony IMX078 sensor and a Novatek 96660 Chipset. The sensor and chipset are the same as the ones used in the previous Apeman A77 model. On the back, there is a 2.0inch LCD screen which is not touchscreen and you will need to use the navigational buttons on the side. There is a shutter button that also serves as an OK button (Enter button). And a shutter light. You have a micro SD card slot, a micro USB port for charging and a mini HDMI port to output to a large monitor/TV or to capture videos using a capture device. At the bottom, there is the battery compartment. There two buttons that serve as navigation buttons, up and down. You use them to control the menu settings of the camera. There is also a WiFi button. So you can actually remotely record. I can go the camera’s settings menu by clicking the front power button once. 1- Resolution: for specifying the resolution you want to use for shooting video footage. 2- Loop recording: that enables you to record footage continuously without interruption. 3- Gyroscope: also known as EIS (Electronic Image Stabilization), it is used to stabilize the video to make it less jittery and smoother. The gyroscope will work with all video resolutions up to 1080p at 60 fps. EIS is not available with the 4K and 2.7K resolutions, so if you turn the gyroscope on while in the UHD 4K resolution, the camera will turn it off automatically. 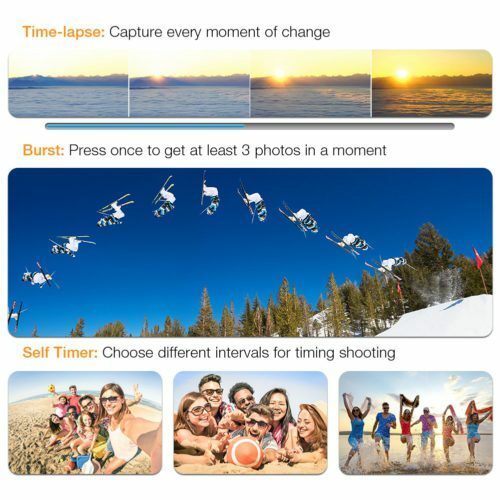 4- Time-lapse Record: To record videos at intervals then play it back at a faster speed. 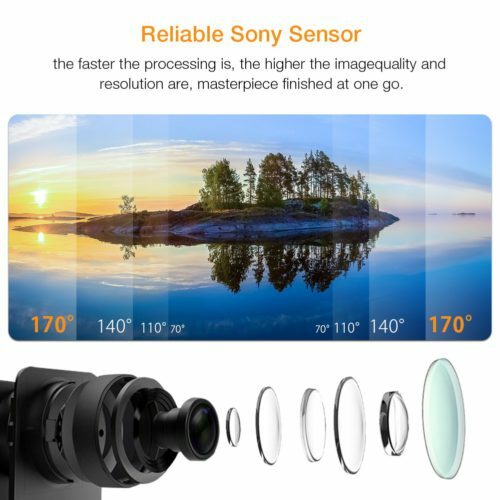 Good for capturing a sunset, sunrise, clouds, etc..
5- Angle: used to change the lens field of view angle: the standard angle is 170 degrees but you can set it to as low as 70 degrees. Then you have the rest of the settings like WDR, Driving Mode, Night Scene, Self Timer, Image Size, Burst, Quality, Sharpness, Motion Detection, Record Audio, Data Stamp, White Balance, Color, ISO, EV Exposure Value, Anti-shacking, WiFi. As you can see, you have quite a few options in the A80 which is nice and it makes it compatible with different shooting times, like shooting during the day or in the night. Also in different situations like shooting moving objects, extreme sports activities or simply just walking around with the camera. 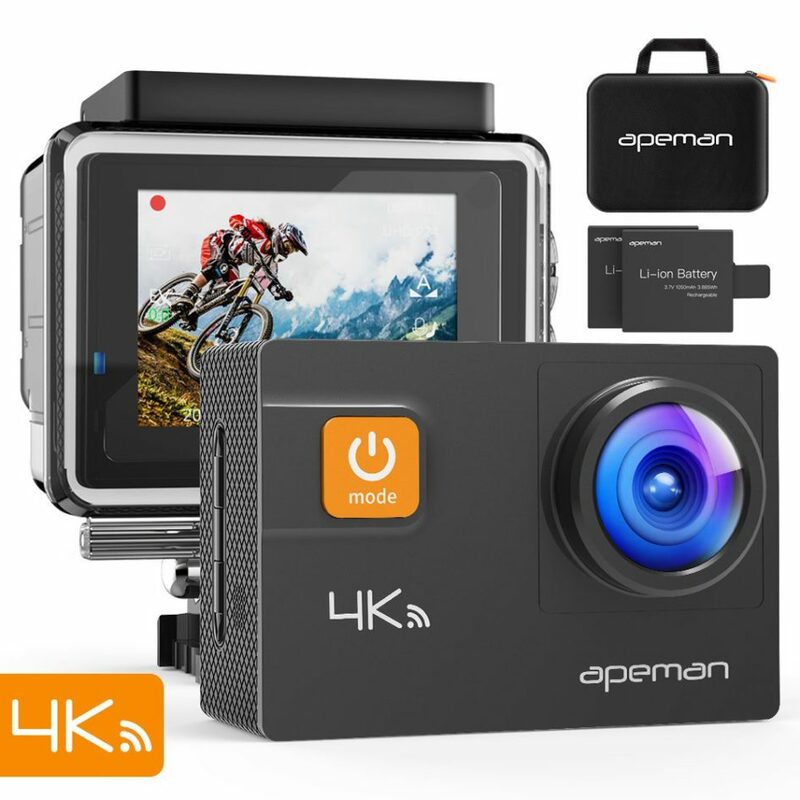 The Apeman A80 claims that it can record 4K videos at 24 frames per second. However, the built-in chipset and image sensor can only record up to 2K videos. Which means that the 4K that the camera shoots is not a native 4K, but more of an interpolated 4K. Know the difference between native and interpolated 4K here. It’s a bit unfortunate to be honest, but remember that it’s a camera that costs less than 80$! The video resolutions start from the highest which is the Ultra HD (4K) at 24fps then goes down to 2.7K/30fps, 1080p/60 & 30fps, 720p/120/60/30fps and down to VGA and QVGA. The video quality is crisp and clear during daytime recording. So it is definitely better than the other cheap Chinese cameras you can find at a similar price. Maybe it weren’t for so much fish-eye, I would have say that yeah it looks a bit better. I don’t think it does the greatest with dynamic range, it had a hard time finding the right level of brightness, details in the shadows. The fish-eye is a 170 degree angle, some can find it too much, but remember that this is an action camera so wide angle is expected. Image Stabilization is great and it really does work with the 1080p resolution, I think this is my favorite feature on the A80 and it does give it a great advantage. Night time recordings are not as good as day time recordings due to the limitation of the lens sensor. The photos turn out quite well when shooting with a lot of light, way better than expected especially when enabling WDR. However, night photos are not the best unfortunately even with night mode ON. But that is expected from most of the action cameras especially the cheap ones. This is also due to some limitations in both the image sensor and the chipset. The A80 can also broadcast WiFi which enables you to connect your smartphone to the camera using the Apeman app called ZSANYCAM. This app is available for download from both the App store and Google play store. Once you install the app, you need to turn on the WiFi network from the camera by pressing the Up button located on the right side of the camera. As soon as the camera is connected, you can see everything you camera sees. From the app, you can fully control the camera. You can take photos, videos, change modes and settings. You can also playback videos and check the photos you just took. Lastly, you can share your footage to social media channels directly from the app so this is another cool thing you can do with the camera. Apeman claims that the battery can last up to 180 minutes but unfortunately the battery life is a lot shorter. I was able to get around 90 minutes of use before the battery died. I guess that is the reason they included a second battery in the box. Charging the battery takes around 3 hours so better to have more than 2 batteries if there is plan to shoot for a couple of hours. Due to the fact that the A80 can be used while being charged and with both the micro USB and mini HDMI ports, this gives it more usage than just an action camera. The A80 can be used for streaming and recording YouTube videos. It can also be used as a dash cam, security cam or even a webcam. Another cool idea is to use it with a gimbal like the Zhiyun Smooth 4, that way you can record with 4K without worrying about the stabilization since the gimbal will take care of that. Overall, the Apeman A80 is a good camera. It doesn’t have a real 4K resolution due to the chipset, it does interpolated 4K instead. But it does perform well when taking videos with 1080p and using EIS, so clear video and loud audio. It’s not that great in low light and the Electronic Image Stabilization is not available in 4K and 2K. Photo quality is good but definitely less than 20 Megapixels as Apeman claims so probably photos are also interpolated. It is definitely not a GoPro or even close to one. Nevertheless, for its price, it is certainly a bargain. 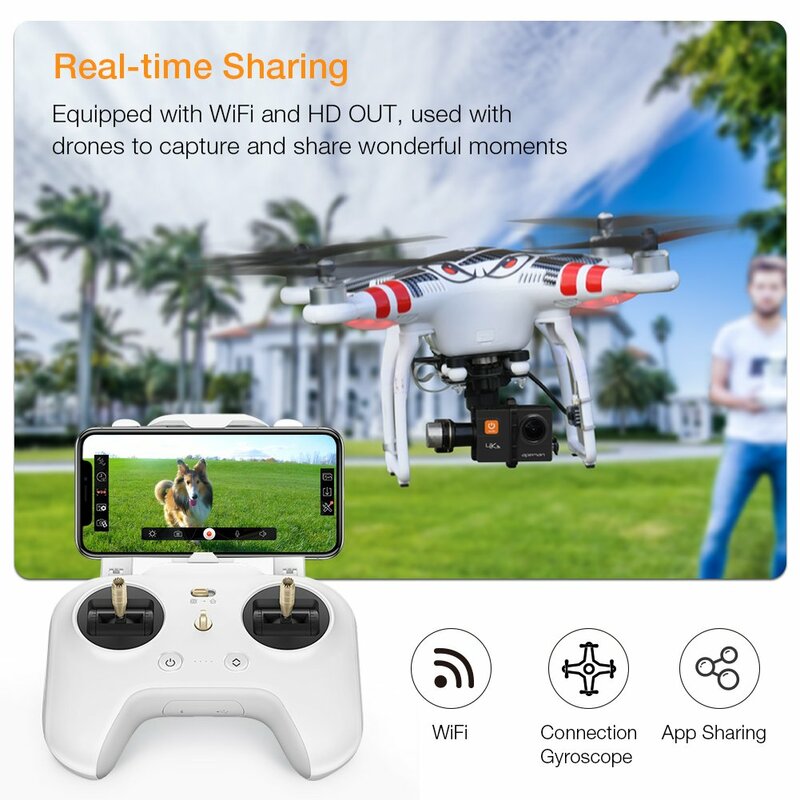 It is fair for what you are getting especially that it comes with 2 batteries, a nice travelling case and a bunch of accessories so you don’t have to spend more money. I liked this camera but it will be up to you to decide whether you will invest in one. I hope you enjoyed my Apeman A80 review and found it useful!